I’ve mentioned Information Product Publishing in a couple of earlier posts as being a potentially good choice of business. For many years it has been popular as a choice for mail order and more recently it has emerged as a top earner as an internet based business. Information products lend themselves readily to the internet, which is a perfect information publishing platform, because the products can be produced electronically in a downloadable format. This means that production and distribution costs are extremely low giving a good potential profit on even modestly priced products. A couple of the early pioneers of information publishing online produced a course several years ago to help others to get started with simple little websites producing information products on a variety of specialist topics, they called it Underachiever Mastery. Why underachiever? Because each website, being narrowly focussed on it’s own topic, didn’t make a great deal of money. But a whole network of these little websites collectively made quite a large amount of money. Times have moved on and this product has been off the market for a long time. But now another prolific information publisher, Russell Brunson, has picked up the baton and is launching a revised and updated version of this course, together with the necessary software tools to make it work more easily. It’s called Underachiever Secrets and it launches today at 2pm EST (7.00pm UK time). I’m helping Russell with the launch promotion of Underachiever Secrets and I’ve set up a new website to do this. It gives the history of the product and the concept together with launch information. I would like to wish all my visitors a very happy and successful New Year. Starting a new business or growing an existing one is particularly challenging at the moment. In all my years of business I have never seen such an uncertain economic outlook. Yes we have been through a number of past recessions, this is my fifth, but there was always a degree of certainty – albeit not always positive! So, where do you want to be at the end of this year? How do you propose to get there? Whose needs can you best serve? What can you do for them that will please and delight them and ensure that they will tell all their friends? Somewhere out there are people who need what you have to offer, all you have to do is find them and tell them what you have and how it will help them, then over deliver to the best of your ability. One of the great things about working for yourself is that, for most of us at least, you can do it from home! As good as this is, as your business grows and you take on staff, then it’s likely you’ll need more space – even if it’s not all the time, having your own office can help you look more professional and help separate work from your home life. Buying an office is expensive and risky, plus potentially limiting. If you outgrow it then you have to sell before you move on, an increasingly difficult task with the currently unstable property market. Renting can therefore provide a great solution, offering flexibility in terms of price, office type and length of lease. If you need a whole building, part of one, a room or even just a desk, there are options to suit every situation and budget. For truly hassle free leasing, serviced offices provide a great solution: Fully equipped and managed, individual offices or floors are rented out. You don’t have to buy computers, desks, phones and cleaning and maintenance will all be taken care of – some even have a reception service, perfect for giving the right impression to customers. This is a great choice for a business that needs to look flash without the cash – the costs of setting this up from scratch would be prohibitive to most small companies. Whether serviced or not, different spaces tend to attract different business types and by getting yourself in with the ‘right’ pool of companies, this could greatly enhance your own offering. Creative environments can be inspiring and if you work alongside a complementary business you may be able to help each other out and go for jobs collectively. If you know a number of businesses in the same position as you, why not pool together and share a building. With risk low on many people’s agenda due to the economic difficulties the country is in, renting a workspace, short or long term, is a great option for any fledgling business. If you expand and everything goes well, you can move on to somewhere bigger and better, but if things don’t work out in your favour, then it’s easy to leave without incurring too much financial hardship. This is way overdue but I’ve intended for some time to produce a series of online training courses for new businesses or even those just thinking of starting a business. With two businesses of my own to run and a growing number of consulting clients finding the time has been a little tricky. Now I’m semi-retired and cutting back on my full day business training workshops the time has come to put my courses on auto-pilot. The ins and outs of starting your own small business along with some of the basic steps you will need to take to get up and running. Some of the different options available for financing your small business, so that you can choose the one that is right for you. An overview of how to create a professional business plan for your small business. Some of the basic information that you must know when it comes to paying taxes for your small business. Some of the common mistakes that small business owners make, so you can avoid making them yourself. 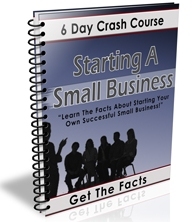 There will be more short courses to come in future but in the meantime find out more about my Small Business Crash Course. You can enroll for the course from that page. Oh! I forgot to mention, this one’s FREE! If you take the course, come back here and let me know how you get on. I would really appreciate your feedback on the course. You can also let me know what else you would like to know about starting and running your own business. Use the comments form below to give me your feedback, or just click the comments link. Before all sales people, associates and affiliates panic let me explain that the above headline applies only to Financial Services Products in UK. The UK Financial Services Authority have had concerns for some time that financial services products are too often recommended by unscrupulous financial advisers on the basis of the amount of commission they receive rather than being the best product for the client. The majority of professional financial advisers in UK, and elsewhere, take pains to provide clients with the best advice they can but there has been a persistent band of rogue advisers who think only of themselves. If you are not in financial services then this doesn’t affect you, does it? Most people in UK don’t pay an adviser for recommending life insurance, investments, pensions etc. because the adviser has been remunerated by the life, investment or pension company by way of commission on the sale. Obviously the companies paying this commission have to make it back in some way and that is by some form of management charge built into the product. This means that the client is actually paying this commission indirectly. Under the new system, the client (you) will be expected to pay the adviser a fee for the financial advice given. This should mean that the product should be better value for money as there are no commission charges to account for and your adviser has no reason not to recommend the best product for your needs. However, if you take financial advice but take no action on that advice you will still have to pay the adviser’s fee. Unlike in the commission situation where you can just walk away leaving the adviser with nothing. Now, back to the financial advisers out there. The good thing about this change is that you will always be able to get paid for financial advice you give regardless of whether the client takes that advice or not. You will be free to advise the client on any course of action you feel is appropriate to their financial circumstances without any concerns about likely remuneration. Your only problems, if you have not been charging on a fees basis up until now, is one of educating the client in the new ways of financial services and setting up the appropriate contracts and procedures to handle the new regime. I’ve been talking to a very senior financial adviser about this as he has operated a fees based financial service for over twenty years now. He certainly understands the problems facing commission based financial advisers over the next couple of years. In fact he has been helping many financial advisers move over to a fees based system for the last ten years or so. His name is Terence P O’Halloran, ‘ Terry’ to his friends, and he has been a major player in the industry for well over thirty years. Terry first unveiled his Fee-Pac product for financial advisers over ten years ago and has steadfastly kept it up to date, improved, evolved and expanded it over the years into a major package suitable for any fees based profession. Fee-Pac now includes a full video training seminar on setting up a fees based business, complete client and adviser documentation as well as all the admin files needed to set up a successful fees based practice. This is an extremely professional piece of kit. If you are a financial adviser or thinking of getting into that business then check out Fee-Pac here. I can’t believe how little he is charging for it considering its potential value to you in the coming months. More and more people are looking to start their own internet business as a result of this current economic situation. Whether to guard their family income from the threat of unemployment or worse, because they have already been made redundant, or simply to top up their current earnings to give their family a better life, they see the internet as a source of future prosperity. When I first started marketing my business online back in the late nineties the biggest problem was so few potential customers on the internet. Competition was not a problem so I found it very easy to reach those customers who did have an internet connection. Ten years on and the world’s population has flooded onto the internet, there are so many products and services available online they are all spoilt for choice. The market is huge and the competition is intense, which makes it very hard for the new entrant to internet business to know where to start. A recent comment from Dominic, one of my readers, on an earlier post said it all, “im tryin 2 start ma own business and would like 2 no the best way 2 go“. Well, I started this website some time ago to try to help people like Dominic but now I’ve gone further. After much searching I have sourced a regular supply of Special Internet Marketing Reports. They cover everything from setting up an internet business, including the basic technical stuff, through affiliate marketing (i.e. selling other peoples’ products on commission), setting up a website, getting visitor traffic and building customer mailing lists. At the time of writing there are 29 reports, each report currently sells for $17 as you will see from the website. As a business coach I get asked about all manner of ‘get rich quick’ scams schemes. Many so-called ‘business opportunities’ come under this heading. Genuine business opportunities require some form of effort, skill or knowledge to be able to take advantage of them and most require time to bring them to fruition. They often also involve a degree of risk if you make mistakes or just get ‘unlucky’. The classic is the ‘make loads of money overnight with no effort’ or the ‘everything is done for you’ approach. There is no such thing as ‘money for nothing’, I know – I’ve searched for years and years :-). In the internet world the latest game is to convince you that your own personal robot or software will do it all for you. An example is a recent comment from a reader on the Forum page about an investment trading robot. No! Software won’t do it all for you, it may take a lot of tedious or routine work off your shoulders, but it won’t make the entrepreneurial decisions or take the key business actions that are essential to success. There are shortcuts to success in business, but they come from your aquired knowledge and experience and working ‘smart’, not from buying some ‘get rich quick’ scheme.